In the year 2000 as a result of a momentous effort to define the human genome, the first complete sequence of human DNA was delineated. From this work, it was determined that only about 3% of the entire DNA structure was relegated to the genes – containing the information for the structure of those proteins that help defines us as human. It was assumed that the remaining 97% of the DNA played no important biological role and was determined to be "junk." To some it seemed inconceivable that so much DNA real estate would serve no biological purpose. As a consequence, a number of laboratories from around the world became involved in an ambitious joint project designed to determine the role, if any, of the non-gene parts of the entire human genome. This work required a meticulous examination of extended sequences of DNA. This endeavor was referred to as the Encyclopedia of DNA Elements (ENCODE). The goal of this project was to find those portions of the non-gene DNA that had an identifiable purpose. In 2007, ENCODE came out with its first preliminary report clearly showing that this part of the DNA contained many varieties of functional elements. As a consequence of this work, a series of papers has been published in the September (2012) issue of the prestigious scientific journal, Nature detailing ENCODE's findings. These extensive and exhaustive studies clearly demonstrate that large non-gene areas of the human genome contain information of functional significance. ENCODE has catalogued an impressive inventory of hidden switches for the expression or suppression of encoded genes, signals –transcription factors - and signposts integrated throughout the length of the human genome. In essence, it now appears that much of the DNA landscape is relegated to regulatory processes. To place this in perspective, roughly 1.2% of the genome is involved in protein coding, while some 8 – 9% is involved in regulatory processes. Furthermore, it seems that these regulatory elements are more susceptible to change – mutation - than the genes that they regulate; this fact has profound evolutionary implications. Finally, it now appears that around 80% of the entire genome is actively transcribed into RNA; this is a remarkable finding that requires further elucidation. In conclusion, it appears that the concept of "junk" DNA can now be effectively put to rest. These results open up whole new vistas for further investigation. One of the main and more ominous characteristic of cancer cells is their capacity to grow beyond the ordinary controls that limit cell proliferation in normal tissues. This accelerated growth ultimately leads to metastasis – the spread of cancerous cells to surrounding tissues from the tissue of origin. It is uncontrolled metastasis that ultimately leads to the death of the patient in the terminal stage of the disease. It has been clearly established that cancer is the result of genetic mutation that gives transformed cells a definitive proliferative advantage over normal cells. Given this property common to all cancers, it would be efficacious to understand the mechanism through which this accelerated growth operates. It has long been suspected that in cancer cells, key metabolic pathways have been altered in such a way as to accelerate cell division beyond normal limits. This process is, however, poorly understood. Through the laborious efforts of Dr. Mohit Jain and colleagues at the Broad Institute in Cambridge MA and at the Department of Systems Biology at Harvard Medical School, Boston, MA, a clearer understanding of the metabolic characteristics of rapidly growing cancer cells has emerged. This group has painstakingly characterized the cell chemistry of 219 known metabolites from a panel of 60 well established primary human cancers in cell culture that reflect nine well known cancers and tumor types. This was accomplished using highly sophisticated analytical tools involving liquid chromatography and tandem mass spectrometry. Interestingly, from this data, it was discovered that the consumption of the amino acid glycine demonstrated a statistically relevant and significant correlation with cancer cell proliferation. Glycine is an amino acid – amino acids are the chemical building blocks of proteins. In addition, it is a non-essential amino acid i.e. the cells of the body are capable of synthesizing this amino and it is, therefore, not required in the human diet. Furthermore, the glycine biosynthetic pathway found normally in the mitochondrion – a cell organelle that is responsible for energy production in cells – was shown to be the pathway of choice for the synthesis of glycine. When the experimenters purposefully, blocked the synthesis of glycine by interfering with the mitochondrial synthetic pathway, the enhanced proliferation of the cancer cells studied was significantly impaired. These findings uncover a previously unknown vulnerability of a wide range of known cancer types. This discovery may prove to be highly significant as a strategy for the treatment of cancer. The addiction to stimulant drugs is a serious issue that confronts modern society. In those so afflicted, it is characterized by a satellite of issues including a behavioral pattern that grows out of control in the pursuit of obtaining and consuming ever-increasing amounts of drugs in spite of the fact that the use of these drugs negatively impacts both the individual's health and his or her social and personal life. In light of recent evidence, drug addiction has come to be regarded as a, "relapsing brain disorder." In support of this view, marked structural changes in the striatal and pre-frontal brain regions have been reported in individuals with stimulant drug addiction. The pre-frontal area of the brain is ordinarily recruited in the regulation and moderation of behavior. Therefore, any deficit within this region may explain the dependency upon stimulant drugs on account of the fact that these chemicals impact those areas of the brain involved in motivated behavior. The question naturally arises as to whether addiction itself causes changes in the structure of the brain or the structural anomalies described above precede the addictive behavior and predispose the affected individual to drug taking and its concomitant risky behavior. In support of the latter argument, the structure of the individual brain is an inherited characteristic and drug addiction is known to run in families. If, in fact, drug addictive behavior is an inheritable trait, the changes in brain structure would be regarded as an endophenotype – a trait that is a direct result of a genetic anomaly (genotype) and that is responsible for the overt clinical symptoms (phenotype). In order to test this hypothesis, Dr. Karen D Ersche and her colleagues from the Behavioral and Clinical Neuroscience Institute and Department of Experimental Psychology and Department of Psychiatry at the University of Cambridge, Cambridge, UK, conducted a study in which, "we compared brain structure and the ability to regulate behavior in 50 biological sibling pairs." As a result of this exhaustive investigation, it was shown that the fronto-striatal regions of the brains showed marked abnormalities in not only addictive individuals but their biological siblings who possessed no apparent symptoms of drug dependency. The demonstration of changes in brain structure in close family members establishes the genetic connection and strongly suggests that such endophenotypic changes predispose the individual to drug addictive behavior. These findings are of immense importance in not only understanding the nature of drug addiction, but also informing the general public and the legal system on how to best deal with addictive individuals. In addition, further studies designed to discover the underlying genetic abnormalities associated with this condition could provide immeasurable help in finding appropriate therapies for this brain disorder. Proteins are a necessary part of the human diet. When proteins are digested they are broken down into their building blocks – amino acids. The body then reassembles these amino acids to produce the proteins required by the organism to live. Proteins play essential roles in all living things, including humans. These roles can be included into two major types – structural and metabolic. Structural proteins maintain the shape and form of the both the individual cells of the body and the whole organism and are essentially responsible for locomotion. As an example, collagen is an essential ingredient of the connective tissue and is the most abundant protein found in the body. In addition, the movement of muscle is due to a fundamental property intrinsic to the structure of muscle proteins – actin and myosin. A specialized class of proteins called enzymes is responsible for all the metabolic reactions that make life possible. There are thousands of different types of enzymes; each responsible for a particular chemical reaction. The scientific discipline that studies these reactions is referred to as Biochemistry. An example of a protein that plays a critical role in respiration is hemoglobin. The structure of this protein is exquisitely designed to react with molecular oxygen that is delivered to the lungs from the air. This protein, like all proteins, is synthesized from the blueprints that are embedded in the gene responsible for its structure. There is an axiom in biology that states that one gene has the information for the structure of one protein – this axiom basically still holds true. Because the structural information for a protein lies in the gene that is responsible for it, a change in a gene – a mutation – can adversely impact protein structure. Such a change would, therefore, be hereditary. Sickle Cell Anemia is a disease in which a mutation in the gene that contains the information for the structure of hemoglobin results in a change in the protein's structure that adversely impacts it function. The techniques devised by molecular biologists and biochemists over the years have helped elucidate the detailed relationships between the structure of proteins and their specific functions. For example, as a result of these efforts, a relationship has been clearly demonstrated between the amino acid glutamine and protein structure. Studies have shown that when there are sufficient repeats of this amino acid – a number of glutamines linked side by side in the protein chain - they may cause a significant change in the overall shape of the protein resulting in protein aggregation. Protein aggregation can adversely affect protein or enzymatic function. The evidence indicates that when these glutamine repeats become extensive in the protein huntingtin and other proteins found in neurological tissues, the result can be neurodegenerative disease. The gene that contains the information for the structure of huntingtin is called the Huntington gene (HTT) and is strongly implicated in Huntington disease – a devastating neurological illness. In conclusion, the examples cited above clearly demonstrate the essential role that proteins play in the human body and the implications for human health when protein structure has been changed due to a genetic aberration. Linus Pauling, the famous Nobel Prize – winning chemist, described diseases like Sickle Cell Anemia and Huntington disease as "molecular diseases" for the reason that the underlying cause can be traced to an adverse change on the molecular level. There are currently many products on the market that claim to be effective household antibacterial agents that are purported to have health benefits by preventing exposure to infectious agents. Although this may have value to some extent, these claims may, in fact, be misleading in relation to overall public health. There is a growing body of scientific evidence that strongly suggests that normal human exposure to the microorganisms that pervade the natural environment may be of value to human health by helping to fine tune the human immune system and thereby prevent the unset of the types of immunological overreactions that are typified by asthma and some autoimmune diseases (an autoimmune disease is a condition that is a result of the human immune system attacking its own tissues). This concept is referred to as the Hygiene Hypothesis. According to this hypothesis, it is vital that the human immune system be normally exposed at a young age to the microbes that are so ubiquitous in the environment. Without these kinds of interactions, it is posited that later in life the immune system would be prone to behave in such a way as to result in inflammatory and autoimmune reactions such as allergies, asthma, inflammatory bowel disease (IBS) and multiple sclerosis (MS). Epidemiological studies have clearly shown that children growing up on farms are considerably less likely to suffer from allergies and asthma as compared to their urban counterparts. This correlation, however, does not constitute proof given that there are many other variables involved. The Hygiene Hypothesis has been given further credence as a result of the findings of Dr. Richard Blumberg, an immunologist, from the Brigham and Women's Hospital in Boston. Blumberg and his colleagues studied mice raised in germ free cages and fed germ free food. These mice are more susceptible to asthma and colitis - an inflammatory condition of the gut. On exhaustive examination, they discovered that these animals had elevated levels of a rare immunological cell type - so-called invariant natural killer T cells (iNKT) in the lungs and the intestines. These cells have been shown to trigger inflammatory responses following exposure to microbes or antigens – molecules that can trigger the immune response – produced by the body. It should be noted here that the mouse animal model has been proven to be a good one; since, there is a very close correspondence between mouse and human immunology. In addition, mice that had been genetically altered to lack iNKT cells do not exhibit colitis even when raised in a germ free environment. Furthermore, when germ-free mice are transferred to a normal environment at an early age, they show a normal distribution of iNKT cells. These are very interesting findings that show a mechanistic rationale for the Hygiene Hypothesis. Hopefully, this kind of information will help individuals make more informed decisions regarding the use of anti-bacterial agents in the home. The term Global Warming that is often associated with the cumulative impact of the buildup of greenhouse gases in the atmosphere does not accurately describe the nature of the consequences of this change in climatic conditions arising from human activity. The more appropriate term is Climate Change. The reason for this distinction is that the near term effect of this phenomenon is not necessarily warming on all parts of the globe. However, dramatic changes in climate including temperature are predictable within this model. Our first order of business is to examine the science that is the underpinnings of Global Warming. This necessitates an examination of the earth’s atmosphere. The major components of the Earth’s Atmosphere are shown in the following table. 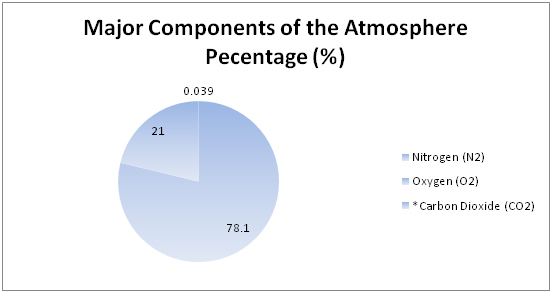 Table 1 – Major constituents of the earth’s atmosphere are reported in percentage and parts per million (ppm) where * indicates the greenhouse gases. The current level of CO2 in the atmosphere is 390ppm (as shown below in Chart 2). CO2 is a by-product of respiration of all living things on the planet. However, this is normally balanced by the uptake of CO2 by the world’s oceans and by green plants that are capable of photosynthesis – these interactions are collectively referred to as the carbon cycle. In this regard, CO2 is the carbon source for all of life. Human activity since the dawn of the machine and the use of oil (hydrocarbon) as a cheap and plentiful source of energy has resulted in a continuous upward climb of this gas in the atmosphere. The reason for this is that when fossil fuels are burned for energy, the by-products are CO2 and water. 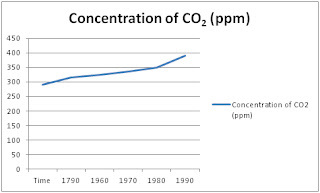 The following chart shows the increase in the concentration of CO2 in the atmosphere over time. Chart 2 – Concentration of CO2 in the Atmosphere over Time where 1790 represents the beginning of the industrial age – the steam engine was invented in 1775. 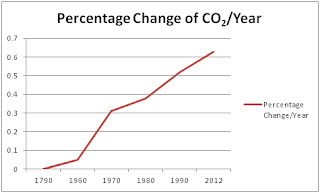 The following chart shows these values as a change in percentage of CO2 per year. Chart 3 – Change in Percentage of CO2 per Year. As can clearly be seen from this representation, the increase of CO2 in recent times correlates well with the introduction of industrialization to human societies. This change might not seem dramatic, but a doubling of the concentration of CO2 from pre-industrial levels is expected to increase the average global temperature by 2.5 degrees C. From the data shown in Chart 3 it can be estimated that if the current rate of increase remains constant (0.63%/year) this doubling would be reached in approximately 100 years. This is an extremely significant increase with horrendous implications for the earth’s climate. Given the current political and economic situation throughout the world, it is unlikely that this increase in the rate of CO2 accumulation will remain static; unless more sustainable sources of energy are actively pursued. In addition, even if the human production of this gas were to halt today, it would take a few hundred years for the current levels to decrease significantly. CO2 is referred to as a greenhouse gas based on its molecular structure. This gas has the ability to absorb heat and retain it much like the glass of a greenhouse allows heat from sunlight to pass freely through it from the outside but prevents some of it from leaving. Therefore, some of the heat that would normally be reflected back from the earth’s surface and dissipate into space is retained. The net effect is a general increase in temperature at the lower part of the atmosphere. The science regarding this property of CO2 is irrefutable. 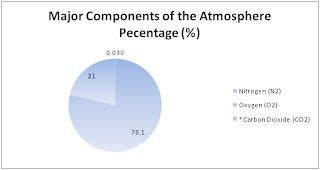 CO2 is not the only greenhouse gas in the atmosphere; the others as Table 1 demonstrates are water vapor, methane, nitrous oxide and chlorofluorohydrocarbons (CFC). Increases in CO2, methane and CFC - synthetic compounds that used to be used widely in refrigerants - are a direct consequence of human activity; whereas, the amount of water vapor in the air is not. There are predominantly two different processes through which heat is transferred throughout the atmosphere. One is through radiant energy as mentioned earlier and the other is through what is referred to as convection. In this process as air is heated near the surface of the earth it rises as it becomes less dense and is replaced by the colder and denser air from above. This process is continuous with the net effect of transferring heat from the surface to higher reaches of the atmosphere. It is the greenhouse gases that trap some of the heat, effectively warming the air in the lower atmosphere. The planet Venus is a striking example of the ultimate impact of CO2 on temperature. Scientific probes of the planet have shown that it has an atmosphere very high in CO2, a dense cloud cover and a surface temperature of over 500 degrees C. Although Venus is considerably closer to the sun than the earth, the thick and nearly impermeable cloud cover would be expected to cool the planet considerably. However, the exceedingly high concentration of CO2 in the Venetian atmosphere would explain most the heat trapped at the planet’s surface. · The impact that increased CO2 concentrations has on the oceans including increasing ocean temperature. This gas dissolves to some extent in water and increased concentrations of dissolved CO2 increases the acidity of the oceans. This has a significant impact on marine life and ocean-based ecological systems. · Increased surface temperature in the northern climes can lead to the enhanced release of methane into the atmosphere from melting permafrost. Methane is not only a potent greenhouse gas, it also possesses toxic properties. · An increase in the frequency and intensity of extreme weather conditions. · Increased melting of land-based ice in the form of glaciers and especially in regards to Iceland and Antarctica. This can have powerful implications in regards to sea-level rise. As a matter of fact, it has been estimated that should all of Greenland’s ice melt, it would cause a rise of sea level by about twenty-five feet. Climate change is a very real phenomenon and, in my opinion, is the greatest challenge faced by all of humanity. The manner in which this issue is addressed will have serious repercussions for the future of the human race.